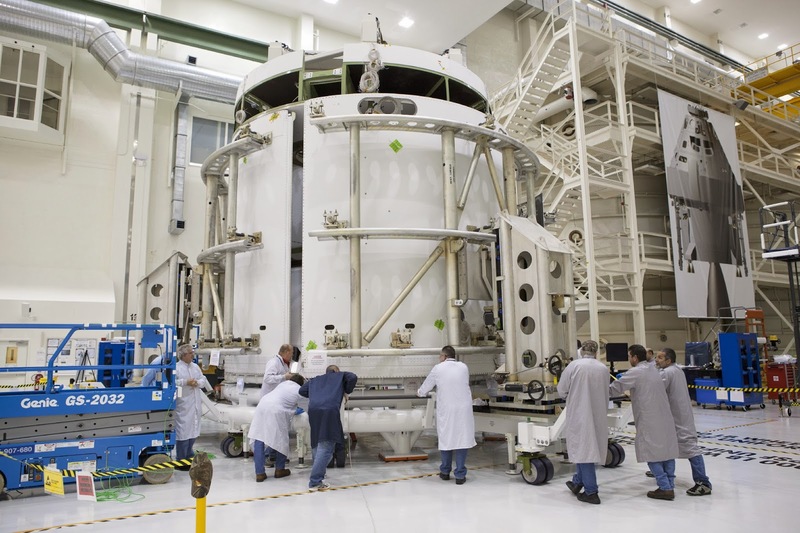 CAPE CANAVERAL, Fla. — Work on the Orion spacecraft at NASA’s Kennedy Space Center is shifting to a new vital phase in preparation for its first test flight scheduled for September of this year. 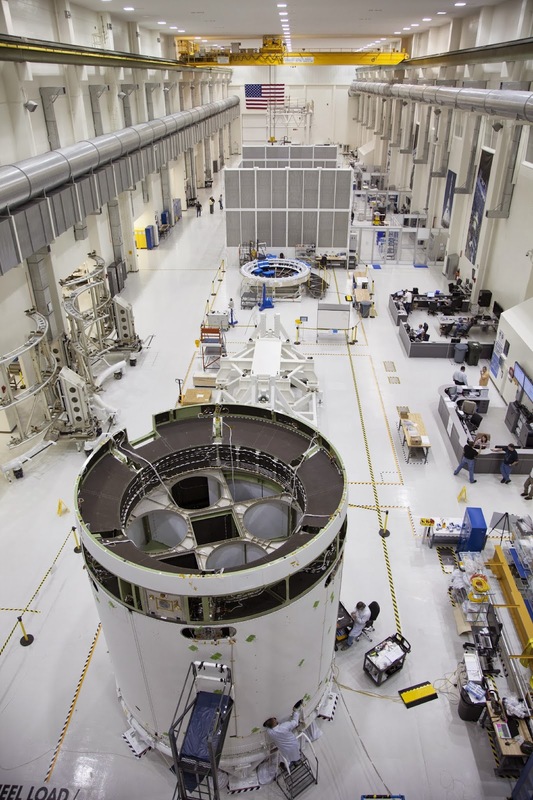 “This really marks the change from assembling a spacecraft to beginning the testing and eventual integration of systems,” said Scott Wilson, NASA’s manager of production operations for the Orion program. Technicians working on Orion’s crew module and service module have nearly completed much of the work needed to begin stress testing the spacecraft's primary components. This includes propulsion and avionics systems used to control the vehicle in-flight, and other wire harnesses and electronic components used to convert what was a stripped down pressure vessel into a working spacecraft. The next phase in this project will be to test the components and systems to ensure they function properly before the scheduled test flight in September. Other tests have been performed on Orion ground-based crew modules, including water landing and parachute deployment, but this will be the first crew module that will fly into space before returning to Earth. The service module, which acts as a bridge to the rocket body and provides additional power and propulsion while in space has all its primary structures complete with secondary systems nearly completed. It too will begin a rigorous testing phase within the next month to ensure its structural integrity before it is eventually joined with the crew module and heat shield. Joining all these complicated systems together will be the next milestone after this phase of testing is completed. Fueling the spacecraft, attaching the heat shield, placement within the service module, attachment of the Launch Abort System, and sending everything to the Cape Canaveral Air Force Station to be placed atop a Delta IV Heavy rocket, will lead to the planned Exploration Flight Test-1 (EFT-1). NASA currently has two areas of focus when it comes to spaceflight in the post-shuttle era. The first being the Commercial Crew Program that works with private companies like Space Exploration Technologies (SpaceX), Sierra Nevada Corporation (SNC) and The Boeing Company to develop spaceflight capabilities for government and commercial projects such as launching satellites and supplying cargo and crew to the International Space Station. The other focus for NASA is the exploration side with planned missions beyond low-earth orbit. This is broken down into three areas; Space Launch Systems (SLS) that will eventually provide the largest heavy lift rocket ever constructed, the Orion program consisting of the spacecraft and all it’s components, and the Ground Systems Development and Operations program that will integrate everything and work on launches and recovery. Exploration Flight Test-1 will also be the first major test for the heat shield that will protect Orion as it reenters the Earth’s atmosphere. The spacecraft will perform two large and highly elliptical orbits that will take it to a distance of around 3,600 nautical miles from the Earth, the furthest distance traveled by a human-rated spacecraft in over 40 years. This will allow Orion to reach speeds around 20,000 miles per hour upon reentry, the same speed it will see when returning from distant missions. Orion’s crew module is larger than the Apollo’s command module and will return to Earth at speeds greater than the space shuttle. All this will create heat friction that can only been fully understood by physically launching it and observing the outcome. Heat tests with arc jets have been conducted by Lockheed Martin in Denver, with temperatures that are greater than what is expected, but it won't be until the heat shield is tested as a whole in space that the design will be truly evaluated. Orion’s ultimate goal is to complete future missions to the Moon, Mars, asteroids, and explore other deep areas of our solar system. If everything goes according to plan, project managers hope to see Orion’s first manned mission fly from KSC in 2021.